HAVANA (Reuters) - Prince Charles on Monday unveiled a statue of English playwright William Shakespeare in the heart of Havana's restored colonial center during the first official visit by a British royal to communist-run Cuba. The heir to the British throne, who is a keen conservationist, and his wife, Camilla, were guided on their city tour by Eusebio Leal, an historian who oversaw a facelift of the Cuban capital's historic center. 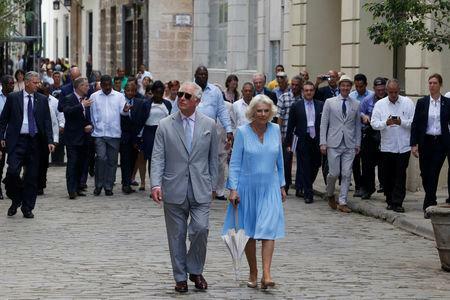 With Charles sporting sunglasses and Camilla holding a dainty cream parasol under fierce Caribbean sun, the royal couple stopped to banter with tourists and Cubans on their walk. The three-day trip aims to strengthen British-Cuban ties as part of a broader normalization of the island's relations with the West, even though the Trump administration has sought to unravel a detente between Cuba and the United States. "He told me the best thing about my place was the air conditioning," said Josefina Hernandez, 58, with a chuckle. She runs a private barbershop in Old Havana where Charles stopped to visit, sitting in one of the antique swivel seats with red leather upholstery. "I would never have thought a prince were so down-to-earth, and that he would choose such a humble place to sit and talk. He said he had just had his hair cut so he didn't need another." 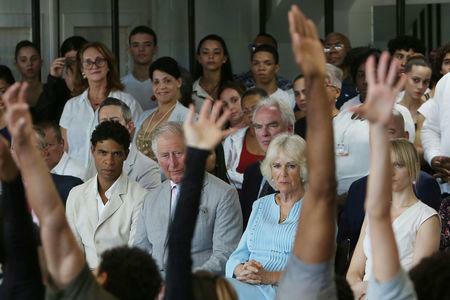 Charles also visited a workshop that trains hundreds of young people in restoration techniques, necessary for the upkeep of Havana, which was founded in 1519. Much of the city has crumbled due to neglect and lack of funds for restoration. "He's a sensitive person who clearly has knowledge of restoration, said workshop director Juan Carlos Botello, 55. "He was very interested in the plaster pieces for the Capitol and signed a piece that will be placed there. We won't paint over that piece." "It is always good for there to be a cultural exchange." The royal couple stopped at several points to listen to bands playing traditional Cuban music including Guantanamera, but they did not visit a memorial garden for Princess Diana, Charles' late first wife, that had been renovated for the occasion of their visit. "I'm disappointed he didn't come," said Margarita Rego, 73, who guards the tiny memorial. "I suppose they must have changed the itinerary at the last moment." Later, the royal couple was due to meet and dine with Cuban President Miguel Diaz-Canel, who succeeded Raul Castro a year ago. "We are honored to receive them and show them with pride the nation we are," Diaz-Canel wrote in a tweet on Monday. 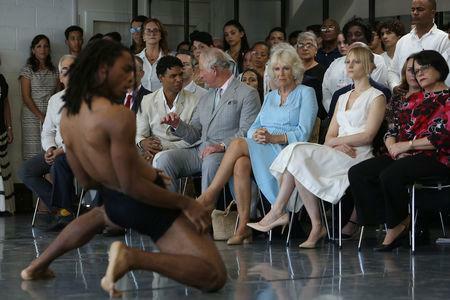 "The visit expresses the good state of our relations."